Nine performance reports have been published and are testament to achieving a common framework of industry-wide reporting and an ambition of continuous improvement. Communicating and educating our colleagues and customers was also a key strategic objective. commitment to transparency and continual improvement. In November 2010, the third report shows the progress towards the vision is being demonstrated by: exceeding government targets on responsible sourcing; exceeding UK average reduction of greenhouse gases; exceeding energy performance targets; stakeholder engagement survey launched. 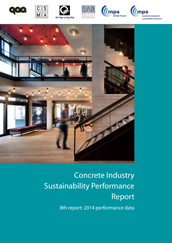 In October 2011, the fourth report presents the concrete industry's sustainability performance in 2010. The British Association of Reinforcement signed up to the strategy and this report includes performance data from this sector. In November 2012, the fifth report, based on 2011 production data, demonstrates how far the industry has come in realising its vision. Many of the 2012 targets have been achieved already and in many cases exceeded. Not wanting to rest on its laurels, the industry has this year committed to further sustainability improvements by 2020 and beyond. In October 2013, the sixth report presents the industry's performance from 2008 to 2012, a milestone year for the strategy as many of the targets for performance improvement were set to be achieved in 2012. The next stage of the strategy is also featured - our commitments to 2020. In March 2016, the eighth report was launched as part of the Concrete and Masonry Pavilion at Ecobuild 2016, as part of an industry updated provided by Andy Spencer, Chair of the Sustainable Concrete Forum and Nigel Jackson, Chief Executive, MPA. In March 2017, the ninth report will be launched alongside the 1st REAP Progress report. The ninth report includes a summary of progress to the 2020 strategy targets, as the industry starts the review that will lead to the publication of targets beyond 2020.